Best Buddies International’s vision is to put ourselves out of business. Our hope is that one day programs like Best Buddies are not needed to provide inclusion in our schools and communities. To meet our vision and spread the Best Buddies mission, we have adopted the 2020 initiative, which is to have an office in all 50 states in the nation and to become a household name. In an effort to meet the 2020 initiative, we are seeking dedicated volunteers who are interested in starting a chapter at your school or workplace. How do I Bring Best Buddies to my school? Find at least one teacher to provide guidance and support at your chapter as an advisor. Host fun and inclusive events all school year long! Elementary Schools: Best Buddies Elementary Schools introduces students to inclusion at a young age. Through events and activities hosted during the school day, students with and without IDD participate in integrated lessons and games which foster understanding, acceptance, and allow for organic friendships to be built between peers of all abilities. Middle Schools: Best Buddies Middle Schools helps to create a place of belonging, comfort, and fun for students with and without IDD. By matching students with disabilities with their peers in a one-to-one friendship, the Best Buddies program strives to eliminate social isolation and provide engaging and integrated events and activities with the leadership of teachers and students. High Schools: Best Buddies High Schools fosters one-to-one friendships between students with and without IDD. With an additional emphasis on leadership training, the High School program provides leadership development and skill building for students with and without disabilities to manage their chapter and develop the skills to lead a movement of inclusion in their school community. Promoters: Best Buddies Promoters empowers youth who attend schools without a special education department to become advocates for people with intellectual and developmental disabilities. With an emphasis on student leadership in promoter’s chapters, students engage their school community with events and activities on their campus that brings awareness to the disability rights community and movement. Best Buddies Promoters chapters are an essential part of the future of Best Buddies and supporting our vision of putting ourselves out of business. Colleges: Best Buddies Colleges fosters one-to-one friendships between college students and their peers or community members with IDD. Our college programs partner with organizations in the community that serve those with IDD to help foster these friendships, known as the Host Site. 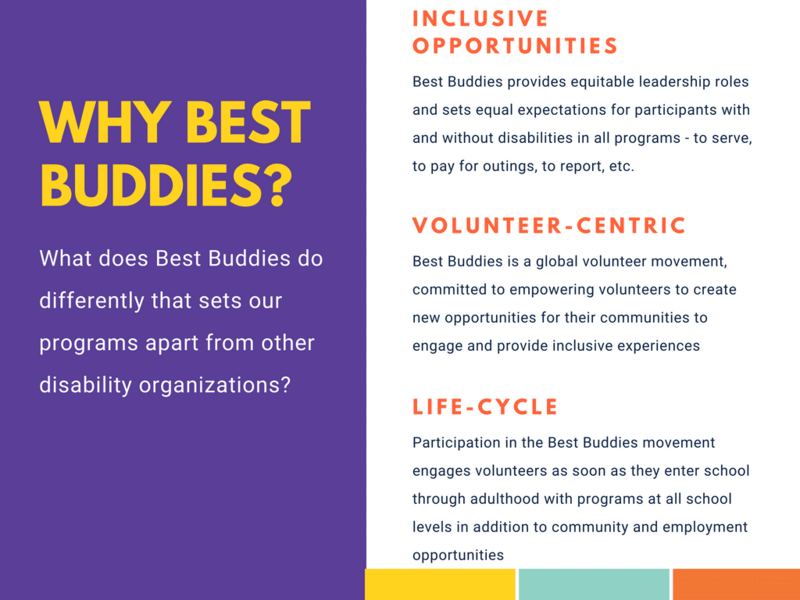 Best Buddies Colleges provides friendship, leadership roles, and activities for people with IDD to stay connected with their community and engage in campus life with their peers. Citizens: Best Buddies Citizens chapters provide companies or community groups the opportunity to get involved in the Best Buddies mission by forming friendships with their peers with intellectual or developmental disabilities. Citizen’s chapters work with an organization in their area that serves those with IDD to help foster these relationships, known as the Host Site. Friendships formed in the Best Buddies Citizens model help to strength their ties to creating more inclusive communities and workplaces. If you are interested in starting a chapter in your school or workplace/community group to help support inclusive friendships, communities, and leaders, please refer to our list of current offices with active programs and reach out to your local state office for more information about bringing a new Best Buddies chapter to your area.